Supreme Master Ching Hai was born in Âu Lạc (Vietnam). She is a world renowned spiritual teacher and humanitarian who went to the Himalayas in search of enlightenment and attained it by practicing the Quan Yin Method. At the sincere request of sentient beings, She conducts world lecture tours, and has been invited to speak at the United Nations as well as in many countries in all five continents. In many people’s eyes, Supreme Master Ching Hai is the embodiment of Divine Love. Her compassion and care extend beyond cultural and racial boundaries to millions of people around the world. And in recognition of Her philanthropy and selfless contributions to humanity, Supreme Master Ching Hai has received awards such as The World Peace Award, the World Spiritual Leadership Award, the World Citizen and Humanitarian Award, and the Gusi Peace Prize from private organizations and the governments of many nations. In addition to imparting the Quan Yin Method to help people reestablish direct contact with God, Supreme Master Ching Hai also encourages them to try their best to beautify and uplift the world. 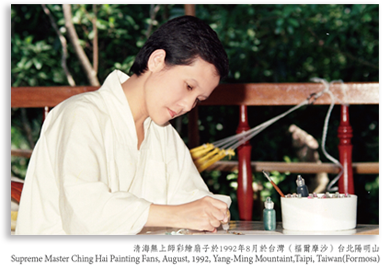 Through practicing the Quan Yin Method She has developed many latent talents that She expresses through an exquisite array of creative works, including oil paintings, fan paintings, decorative lamps, musical compositions, poems and aesthetic jewelry and dress designs. She says, “Once our inner Almighty power is awakened and developed, there is nothing that is impossible! 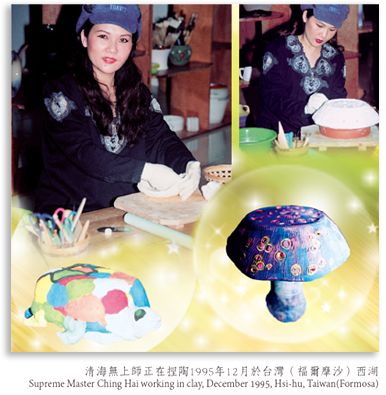 We are here to learn, to learn to grow as well as to learn to use our power, our limitless power of love and creativity, to make the world a better place wherever we happen to be.” Through Her rich, varied artistic creations, Supreme Master Ching Hai confirms these words and practices what She teaches.